In this blog post I give some information on the infamous 1963 ghost photograph 'The Spectre of Newby Church' and my thoughts on it. 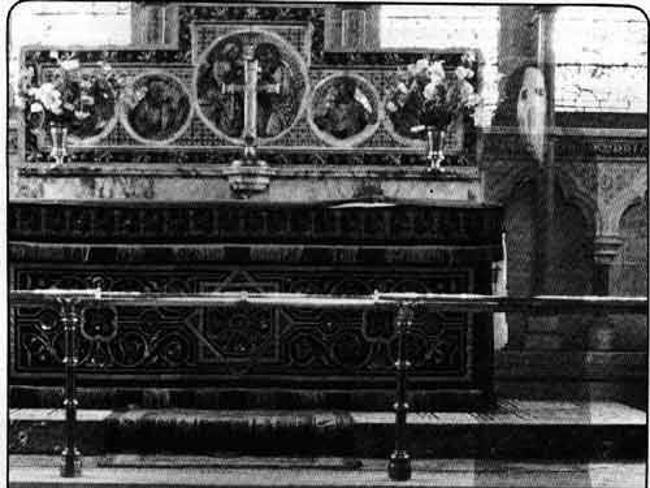 Reverend K.F Lord took a photograph in 1963 of the altar (which he was fond of) at North Yorkshire’s Newby Church (built in 1876), upon developing the photo he was surprised to find a semi-transparent ghoulish figure standing on the first step to the altar. The photo has become known as The Spectre of Newby Church. The figure, when compared with its surroundings, can be judged to be a shocking nine feet tall. It appears to be dressed in a long robe, sparking theories that it is a sixteenth-century monk. Some people suggest that there are no hands or arms visible and it appears to be wearing a white sheet (with depressions for eyes) where it face should be. But what I see is a figure that seems to be elongated, stretched out abnormally, with its hands pressed against its cheeks, resembling The Scream painting by Edvard Munch. Which is why I often refer to this photograph as The Scream Ghost. Interestingly the church did not have a reputation for being haunting, nor has the spectre been seen before or since. After the photo went public it pretty much went, what we would call these days ‘viral’. As the photo was simply ‘too good to be true’ sceptics immediately shouted ‘double exposure’ and rightly so, as I'm sure we can all agree the photo is ‘too good’. However it is unknown how he could have created the stretched large figure and the photo was sent away, to scientists to examine and test, they concluded that it was NOT a double exposure and there had been no tampering with the negative. We must also remember that the photographer was a Reverend with a reputation for being honest and he had a lot to lose should the picture be proven to be fake. So what do I think of it? I am very much in two minds over this, on the one hand it is far ‘too good to be true’ and does look a little ridiculous, on the other hand, over the years I have come to believe in spirits and some kind of an afterlife from my own experiences, the photo has been well scrutinised over the years and has yet to be found to be anything other than genuine. So I guess I'll let you decide for yourselves. Fake or Real? Notice: I do not own the copyright to the photo, nor do I know who does. The image is used here purely for educational and illustrative purposes.